What a wonderful sight to cheer up an Autumn garden. The rain in the last week has cheered up my Winter veggies. So much to look forward to. Today I started to clear out my greenhouse. The automatic watering system was taken apart and scrubbed, and I moved in some growbags and planted some of my Winter lettuce seedlings. I don't seem to have remembered the successional planting rule... so there are about 30 lettuces all ripening at the same time... suppose I will have to get a rabbit! I cannot get rid of these! Not a big problem seeing as how I love Jerusalem Artichokes. Only downside is that they give you wind - not just the average 'blow a candle out' wind - I'm talking megawats of alternative energy - type wind. Nevertheless, huge fun with a group of close friends on a rainy day..
Jerusalem artichokes are named from the Italian word for sunflower - gira soleille - meaning turn towards the sun. 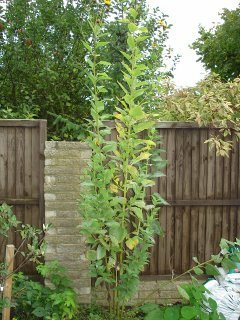 This time of year there are attractive yellow flowers at the top of the plant which is about 12ft tall at the moment. Should be ready to dig up in December. My Mother used to cut recepies out of Womens magazines and stick them into a scrap book. Anyone remember Womans Weekly, Womans realm, Womans world, Woman at home...? Ahh such homely pursuits... Anyway this is a well used, well tried and well trusted recepie for Pumpkin Pie. Pie crust, or line a 10" flan dish with pastry. Really whip together the sugar and eggs, gradually add the cream and milk, and then gently fold in the pumpkin puree. Season with spices to taste and add the brandy. Do not be alarmed at the pouring consitency of the mixture, think of it as an egg custard. Pour into the pastry case, and place in preheated oven at gas #8 just for 10 minutes. Then reduce the heat to #3 and cook for 30 mins or until cooked. 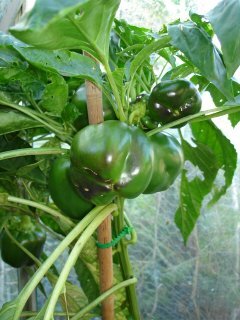 These green peppers survived better outdoors than the ones in my greenhouse. 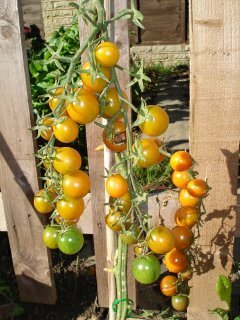 These were from some free seed given in the "Kitchen Garden Magazine" , a variety called "Yolo Wonder". Like my chillis they have not ripened yet. 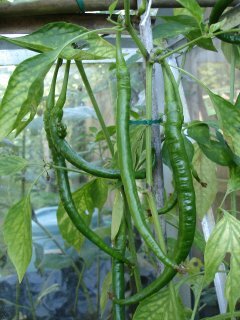 Apparently you can keep a chilli plant in a greenhouse over winter and they will survive - I think they might be perennial or biennial... or something like that. My beloved Bob Flowerdew was talking about them. I will have to go and find out - unless, of course you know different? This Sungold tomato was a volunteer. Let me explain - I had mulched my tomato hedge with a thick layer of compost, when a few weeks later (back in May) a little bunch of tomato seedlings were poking their way out of the soil. A sungold tomato in the compost from last year had germinated about 30 seedlings in close proximity. I admired their will to live. Potted up a few, and here is one. 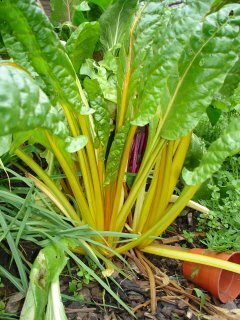 So glad I will have some seed for next year, they are fantastic and very very sweet. The main growth for this year has been cut right back. Here are the new shoots for next year. These can be left in situ, or taken as cuttings and potted up for a new plant. Does anyone know how to prevent a severe infestation of blackfly??? Please help! 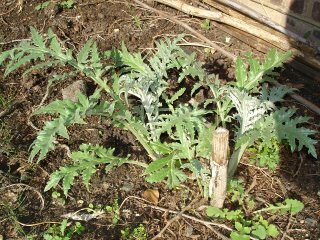 Fantastic artichokes this year completely infested. I spaced out my broccoli a little more this year. 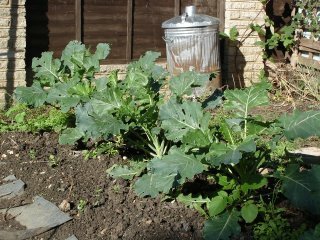 In previous years I have planted them about 12" apart in order to acheive a "broccoli hedge" (I like hedges don't I?). This year I had more space and fewer plants. EVERY day I have to search the inner and outer leaves for caterpillars, and every day I find more than one. The colder nights in the last week might help keep the numbers down. Carry on squishing! These are a variety I grew from free seeds from the Gardener's World chilli trial this year. The variety is "Joe's Long". The plant is about 5ft tall, I grew 3 in a growbag in the corner of the greenhouse. They haven't ripened yet, I have cleared most of the other plants to give them as much light as possible - most of them are between 8" and 10" long. Hope they ripen, they look extremely attractive. Whilst walking through the orchard at Brogdale, our guide just picked apples and pears and cut them up for us to try. 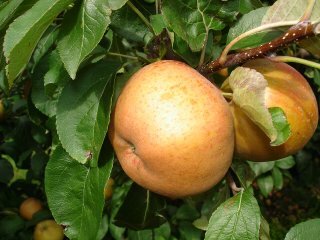 The Russett apple has the most wonderful flavour and texture. Looking through the gardening magazines this month, there are many apple festivals around in the next few weeks. 800 varieties of apples will be on display at Brogdale. That's some fruit bowl !